Creating, editing, and storing training set data are all accomplished with the GRAMS IQ Training Set Editor. This easy-to-use editor is similar to many spreadsheet programs and can accept data from typed input as well as the Windows Clipboard. Users can import files from previous versions of PLSplus and Discriminate as well as data sets with constituent information from other vendor formats. 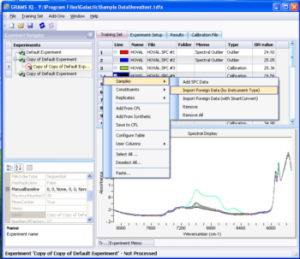 GRAMS IQ’s unique Experiment Navigator organizes all your calculated data with a copy of your original raw calibration data (spectra and constituents) into one Training Data File. 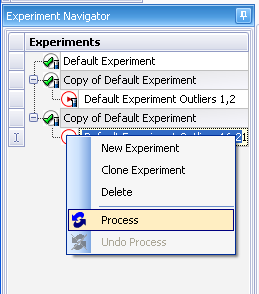 The Experiment Navigator also keeps a running history of all attempted calibration models and can easily clone your experiments to try multiple variations of similar conditions. 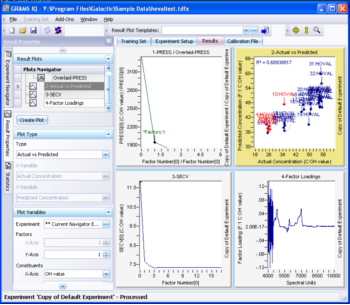 The Experiment Navigator includes the most popular multivariate algorithms (PLS-1, PLS-2 and PCR) as well as qualitative methods including PCA for performing simple data exploration and visualization. Thermo Scientific’s PCA/MDR discriminant analysis algorithm is also included for constructing highly specific models for compound identification. Advanced diagnostics such as Self Prediction, Leverage Validation and Cross Validation will help you in determining the correct calibration model. In fact, sample rotations can be set for one or more samples at a time using different ordering options to give the best distribution during cross validation. Individual samples and constituents can be marked as outliers to create better calibrations after pilot experiments have been run and analyzed. In addition, the highly optimized code insures that the calculations are fast. GRAMS IQ offers many preprocessing algorithms to help remove undesirable variations from your data before it is used in any calculations. A visual spectral region editor provides easy click-and-drag region selection. Superimpose data set variance or constituent correlation spectra on top of the raw or processed spectra for optimal region selection. With the GRAMS IQ Result Viewer you can view and plot all calculated data and a variety of diagnostic indicators that are stored in GRAMS IQ training data file experiments. This powerful feature assists in optimizing the calibration model, determining if there are any outliers in the training set, evaluating model performance, and determining the number of factors to use in the final calibration file. The versatile Result Viewer is capable of displaying multiple plots simultaneously from one or more experiments. Users can ‘paint’ multiple outliers directly on the plots and save a new experiment with the marked outliers removed. Overlay plots to compare performance of different models and calibration conditions. With the report generator you can export all calculated data to a rich text document or copy it to the clipboard for use in spreadsheets or word processors. After determining optimum conditions, you can save your final calibrations. Multiple calibrations can be saved in the same file, even from different training sets. Calibrations are linked indelibly to the training data file used to create them for validation purposes. IQ Predict prediction Setup allows you to specify how a spectrum is analyzed and how to output the results each time you execute a calibration. 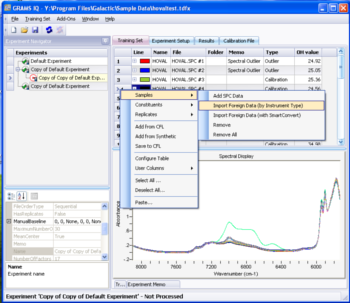 Users can predict samples against multiple calibrations to determine if the spectrum matches the calibration well enough to give an accurate prediction. Qualitative tests can be performed using quantitative models as if the calibrations were designed for that purpose. Using Discriminant Analysis as a prefilter before applying quantitative calculations allows IQ Predict to select the calibration that best matches the sample spectrum. In addition, outlier samples can be quickly and easily determined during sample prediction giving you the utmost assurance of the results. You can customize the prediction report to include constituent quantities, Mahalanobis Distance, Model Limits Tests, and spectral residual. Users can organize the report by constituent, calibration or sample and print, copy, or save the report to an ASCII file. 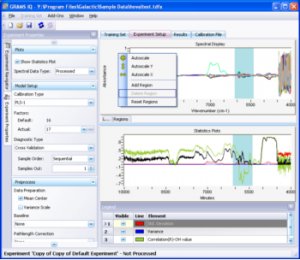 Each copy of GRAMS IQ includes the IQ Predict run time calibration deployment tool. In addition, many 3rd party instrument systems on PC and portable platforms can use the calibrations directly.